All teams practice and train prior to the spring training season starting as well as in between games. The pitchers and catchers usually report for first practices in mid-February, and the other position players report the following week. Typically, practice sessions begin between 9 or 10 a.m.
People will arrive early to try to get autographs as the players and coaches arrive. Another strategy for autographs is to be there when the players leave, usually around lunchtime. The newer stadiums have many practice fields, so you may be walking around to see different drills and different positions at work. Likewise, newer stadiums tend to have plenty of viewing space for spectators, and there may be concessions or souvenir shops open. You may be able to bring lawn chairs at the facilities where there is more space. The typical way to watch spring training practice session is view from outside a fence. One final tip: attending a Spring Training practice isn't like watching a game. It can be boring, depending on which skills and drills the players are working on. There is no charge to attend a Cactus League team practice session. There is no charge to park. They are usually not well-attended, so there's no need to worry about crowds. Here are the Spring Training practice locations for the teams of the Cactus League. 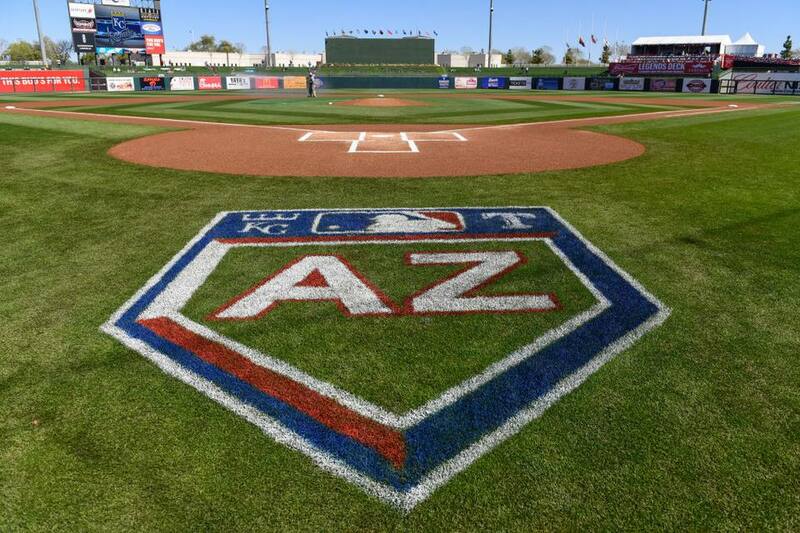 All practice sessions are held in the Greater Phoenix area, as are all Spring Training games. ​Here is an interactive map of all the Cactus League Spring Training stadiums. The team practices at the diamonds adjoining Salt River Fields at Talking Stick, starting at 9:30 a.m. It’s a lovely experience to wander the fields and the ballpark; take the time to check out the Colorado Rockies practices as well. The Cubs practice at practice fields to the east of Sloan Park. The workout facility is separate from the ballpark. There’s plenty of parking next to the ballpark, and bleachers are installed next to the main workout field. Practices begin at 9:30 a.m. The team practices at the diamonds adjoining Camelback Ranch-Glendale, starting at 9:30 a.m. or so, with gates to the complex opening at 9 a.m. This is one of the most sumptuous workout facilities, with manicured lawns and a rolling landscape: take the time to wander through and check out Los Angeles Dodgers practices as well. The team practices at its Goodyear training complex, starting at 9:30 a.m. You can also walk over to the nearby Cleveland Indians workout facility as well. The team practices at its Goodyear training complex, starting at 9:30 a.m. You can also walk over to the nearby Cincinnati Reds workout facility as well. The team practices at the diamonds adjoining Salt River Fields at Talking Stick, starting at 9:30 a.m. It’s a lovely experience to wander the fields and the ballpark; take the time to check out the Arizona Diamondbacks practices as well. The Kansas City Royals open the gates for workouts at 9:30 a.m. daily at the practice fields adjoining Surprise Stadium. This will also give you a chance to check out Texas Rangers practices as well. The Angels train at the six full fields adjacent to Tempe Diablo Stadium. Practice traditionally has begun at 9:30 a.m. The team practices at the diamonds adjoining Camelback Ranch-Glendale, starting at 9:30 a.m. or so, with gates to the complex opening at 9 a.m. This is one of the most sumptuous workout facilities, with manicured lawns and a rolling landscape: take the time wander through and check out Chicago White Sox practices as well. The Brewers open workouts at 9:30 a.m. in the practice fields adjoining Maryvale Baseball Park. The A’s train at the Lew Wolff Training Complex (formerly Fitch Park) (160 East 6th Place, Mesa). Practices should start around 9:30 a.m., with players dressing at Hohokam Stadium and busing to the ballpark. The San Diego Padres begin practices at 9:30 a.m. in the outlying practice fields at the Peoria Sports Complex. The Giants practice at Scottsdale Stadium. Workouts start at 10 a.m. Most of the time the major-league squad can be found in the ballpark; occasionally you’ll see some specialized practices on an adjoining diamond. Minor leaguers work out mornings at the expanded facilities at Indian School Park, 4415 N. Hayden Rd. (at Camelback Road). This is more than just a workout facility: it’s a great complex designed both to showcase players and provide comfort to fans as they watch a practice. The Seattle Mariners begin practices at 9:30 a.m. in the outlying practice fields at the Peoria Sports Complex. The Texas Rangers open the gates for workouts at 9:30 a.m. daily at the practice fields adjoining Surprise Stadium. This will also give you a chance to check out Kansas City Royals practices as well. Everything you need to know to get in on Cactus League action -- team schedules, tickets, stadium information, maps, team gear, photos -- can be found in the Arizona Spring Training, Cactus League Guide.